There is nothing glamorous about cleaning a bathroom. Even if you have a Martha Stewart streak in you, you have better things to do than making sure mildew isn’t taking hold. 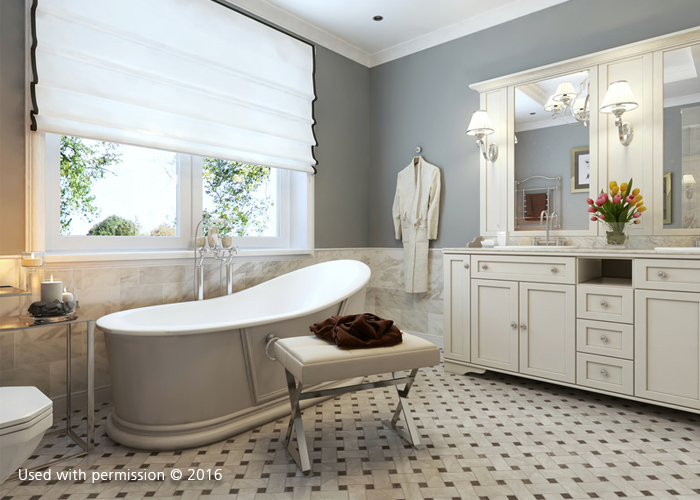 Fortunately, a few design tweaks can help you ensure your bathroom stays fresh and clean without a lot of hard work. Having a solid wall surface will save you a lot of time cleaning your bathroom. Stone slabs are ideal in the shower because they don’t have a lot of seams and those they do have are thin. If you can’t completely do away with grout lines, limit them in number and thickness. Additionally, you can ask your bathroom remodel company to use darker grout instead of the standard white, which shows dirt and mildew easily. In a place that gets wet a lot, cleaning glass is a pain. If you want glass shower doors, opt for a frameless model to avoid the aluminum frames that collect a lot of gunk. Don’t forget to take advantage of glass coating options that help repel soap scum and water spots. Whatever kind of shower wall installation you might have, a handheld shower head will come in handy when it’s time to clean the shower area. Make sure yours has a long hose that will let you reach all corners to be cleaned. A textured wall contains a ton of little pockets in which soap scum and grime can settle. If you really must have texture, choose one that feels the smoothest. This will be easier to clean than mosaic tile or other surfaces that are rough and scratchy. Want more easy-to-clean bathroom ideas? DreamMaker Bath & Kitchen of Orland Park is at your service. Talk to us by giving us a call at (708) 320-3417 or filling out our online contact form.